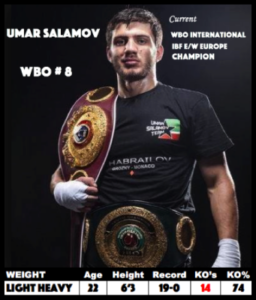 Light heavyweight Umar Salamov came in at number 8 in the WBO’s latest ratings after his stellar performance stopping Emil Markic (24-1) on the undercard of Joseph Parker’s heavyweight world title defense in New Zealand earlier this month. At just 22 years old Salamov stands an imposing figure at 6’3 tall and has already achieved plenty in his 19 fights to date. He has held 2 versions of world youth titles with the IBO and WBO, the WBO European and IBO World titles. In his last outing, he secured the WBO International & IBF East/West European titles. He is set to go again on July 2nd on the Jeff Hon vs Manny Pacquiao undercard where he is scheduled to face former Aussie Olympian Damian ‘Super’ Hooper. Trainer Kevin Barry said: ‘I am hearing rumors Hooper is treating this fight as his own personal version of a world title fight as he knows doors will fly open for him if he can get a win over Umar. “So we are training for a hard-long fight against a willing opponent who has excellent skills. Umar’s manager Kazbek Aslambekov said it would be foolish and disrespectful to look beyond Hooper at this stage other than confirming it is the team’s intention to have him fight at least two or three more times in 2017.